Let us know if you want that we organize transportation. No disorder, no drugs, no prostitution accepted. Safety for swimming in the natural pool. Experience a different lifestyle under the tropics! 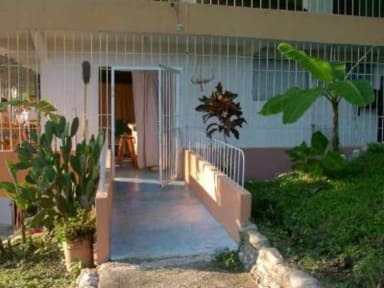 At Suncampdr countryside apartments, you will find peace in a friendly atmosphere and you are not far from the beach. Our apartment and rooms are furnished and have an equipped kitchen. Free Wifi internet. You can play pool, enjoy a barbecue by the river or sit quietly in kiosks to read or get involved in a nice conversation. You will enjoy discovering the culture of the people in our friendly typical village. close to tyou can reach the beach with economical public tranportation every 4 minutes.We are perfect for backpackers on a budget! We can great you at Puerto Plata bus or airport with your name on a board. We charge less than a taxi. You will receive a personalized welcome and guidance and tips about your trip around the island. Suncampdr is often the starting point of different excursions offered to you in the Dominican Republic.